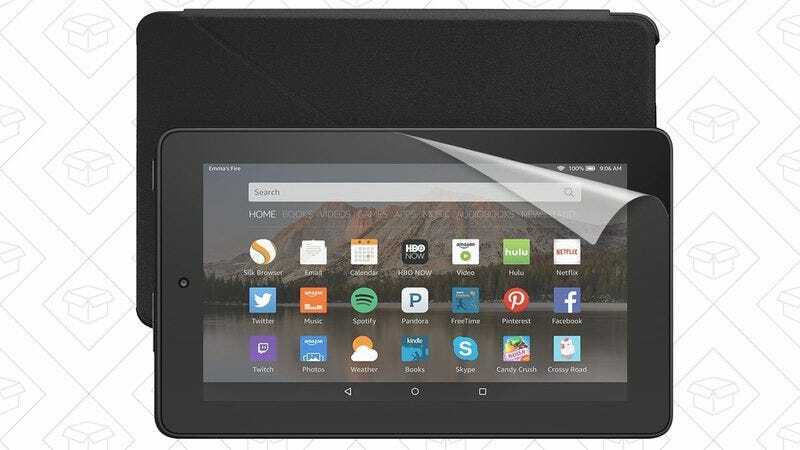 Amazon’s Fire Tablet doesn’t exactly feature bleeding-edge technology, but hey, it’s a perfectly good portable TV screen and web browser for $50. Today, you can get the upgraded 16GB version (which retails for $70), a case, and a screen protector all for $60 with promo code FIREBUNDLE. Yes, that’s $10 less than you’d normally spend on the tablet by itself. Whether you’re upgrading to 802.11ac, need a few extra ethernet ports, or just want to stop forking over a modem rental fee to your ISP, today’s Amazon Gold Box is overflowing with TP-Link networking gear. The most exciting deal in here is probably a 16x4 DOCSIS 3.0 modem for $68, with a bonus $20 Amazon gift card thrown in. Even without the gift card, that’d be a good price on its face for that modem, and it’ll pay for itself if you’re currently paying a monthly equipment rental fee to your ISP. You’ll also find several popular routers (including the Archer C9), ethernet switches, range extenders, powerline kits, and more, all marked down to great low prices. A few more of our favorites are below, but head over to Amazon to see all of the discounts. Just remember that like all Gold Box deals, these prices are only available today, or until sold out. There’s no such thing as owning too many charging cables, so go ahead, buy a four-pack of Lightning cables or five microUSBs. Or both! There’s not a whole lot to say here: This phone stand has nearly 4,000 reviews, looks great, and is only $6 today with code 6VGBXP2D. Why wouldn’t you put one on your desk? This 58-piece screwdriver set is marketed as an electronic repair kit, but with a snake attachment and tons of bits (including pentalobes for Apple products), it could come in handy for all sorts of repairs in hard-to-reach places. We post deals on inexpensive solar motion lights all the time, but while this model from Sunforce is more expensive at $30, it differs in a few key ways. Its solar panel can be placed up to 15 feet away from the light, so you could mount the light in a shaded area. It includes 80 LED bulbs, compared to eight to 20 in most alternatives. The motion sensor can be pointed left or right, meaning it can spot people walking up the driveway more quickly. Rather than a non-replacable built-in battery, this includes three rechargeable AAs, which you can swap out as they wear down. This Gold Box deal is only about a dollar shy of this model’s all-time low, but it’s only available today. It’s a scientific fact that every outdoor space looks better with copper string lights, and $10 is a fantastic price for a 33-foot strand, especially one with a remote that can power them on and off, and even make them dim, pulse, and strobe on demand. Let’s get this out of the way early: Yes, BioBidet is a terrible brand name for a kitchen faucet company. Okay, moving on. Their FLOW faucet has pretty much every feature you’d want in a kitchen faucet: a retractable hose, an attractive design, and a hands-free motion sensor that runs on AA batteries, so you don’t have to have a power outlet available under your sink. Today only, you can get it in brushed nickel or chrome for $170, an all-time low. Just be sure to get yours before the deal gets rinsed away. Your co-workers and family members will cower in fear during your next Nerf gun fight when you pick up the Rival Atlas XVI-1200 Blaster for an all-time-low $25. Rather than darts, this blaster shoots two “high impact” yellow balls at once at up to 80 feet per second. Good luck dodging that.